First impressions are everything, and when it comes to getting your new business up and in front of people, they are even more important. Getting the branding of your new business right can, therefore, seem like a monumental task! Many people also misunderstand what exactly branding is, is it simply pretty pictures for your business or is there more to it than that? To give you some answers we asked neatly’s very own branding expert Phillip Penaluna to sit down with us and explain a bit more about the subject. Phillip crafted the look and feel of neatly, any design work you see on neatly, from UI to the website, will likely have been created (or at the very least inspired by) Phillip. 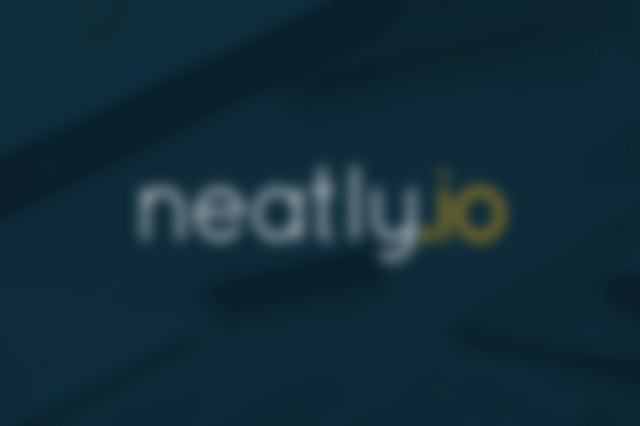 First things first for the neatly users, tell us a bit about yourself! Well, I am Phillip Penaluna, and I’m a designer. Started my career just under 10 years ago after growing up with a passion for art. All of it, photography, drawing, music, skateboarding, cooking. I have always enjoyed creating things. But you don’t care about that, it’s just the back story! I have tried to put myself in an environment that allowed me to explore all areas of design, starting in fabrication, then branding and advertising, a print agency and then to digital. Not because I wanted to know everything, but to understand everything. If I was asked to create a logo, for example, I needed to know that it would still translate if printed in a brochure or sitting at the top of an email or website, even as a 10ft tall sign outside the physical store or head office. I love working in a team, as they just aid in my goal of understanding. Developers help me understand the capabilities of technology (well tell me what I can’t do! ), marketing teams teach me the power of a brand after the design is all done and dusted. Understanding and learning is my goal because it’s a goal that lasts a lifetime. And in case you do not care about that either, I live in Newcastle, England, and my dog is called Seku…she is an Alaskan Malamute. Obviously, as a Creative Director you’ll be a little biased, but tell us, why is branding so important to business’? Everything is unique… just like everything else. Standing out is part of the branding bubble but it is not the most important aspect. Cohesion and consistency within a brand is the key and done right, it is so powerful. It promotes trust, reliability, experience, and the notion that this business knows what it is doing. Your branding is your business’s first impression, and just like talking to a girl in a bar. If you get it wrong you don’t always get a second chance. But then just like a relationship, your brand must stay consistent and reliable throughout; your tone of voice, business cards, adverts, websites etc. It must stay recognizable to stay powerful and in control. You see 2 golden arches on a red backdrop, you know everything about that business; fast food on every corner, cheap fix food in a rush that promotes healthy eating but does not sell it. And the fact that you now really fancy a BigMac all of sudden. And that funny story about when you and your mates were in Greece and you went to McDonald’s when you had too much to drink and that…….. You get the point. That all started with a cohesive and consistent brand. You can become so powerful that your brand becomes the product, just like Jacuzzi, Tupperware, Post-Its, and even Bubble Wrap – all who started as a brand who sold…. whatever the product is actually called. I didn’t know that Bubble Wrap was a brand! So if I’m starting a new business and I’ve never really looked at branding before, where should I start? Just a logo and website? There is a huge step before any of that, and this is what people tend to miss, and I personally believe this is the most important place to start. Ask yourself, who are you, what is the purpose of your business and who is your target audience. Write down the answers and create a personality, a tone of voice. This is how your business will be perceived and how people will engage with it, and how you engage with them. The answers to these questions will shape your business values; you know the ‘this is what we do and why we do it’ statements. That’s your starting point. These values will then dictate how the logo looks and feels, dictate how the website is styled and how your content is pushed etc. So to give a checklist, start with understanding your business, and get a set of values, then a logo, depending on the nature of your business a website is a good thing to move onto next. But within that, you have so much to do, to make sure it stays consistent, photography styles and typeface choices for example. But if you have your values locked down, these are just checked off tasks rather than daunting individual projects. Once I have those values locked down, what are some of the key things that I should focus on in my branding as my business grows? As mentioned before, consistency is key. As you grow, make sure your website remains on brand with all of the updates. You want your 2017 advertising campaign to blow 2016’s out of the water, but make sure they still portray the same brand values. A recognizable brand is a standout brand. Also as you grow, make sure you and your team stay on brand. As the owner it’s important to take the time to re-read your original values, to make sure you’re still following them rather than just getting swept away in the flow of stress, which is easily done in today’s world. When looking at new members of the team, they need to fit your brand also. If you own a cycle store, you don’t want to hire a high on road rage for cyclists salesman. But as you grow – consistency is the focus and maintaining your brand values and principles throughout is key. So as you have probably picked up so far, branding is not just a design or pretty logo, these are actually byproducts of your overall brand. What’s the best example of branding you’ve seen? Disney has nailed it! And Walt has his legacy secured forever. The brand is his name and the logo is his signature. What could possibly as unique as that! Disney’s most treasured asset isn’t something that you can’t touch, see, measure or weigh, it’s magic. Disney sells magic in its movies, in its toys, its parks, It promotes magic as a lifestyle. Its bus is even called the Magic Express and its cruise name is named Magic, too. No one is immune to the Disney magic. Once people taste it, they crave it, and will sit waiting for the next fix! Who is scared or put off by Disney? No matter who you are or what social categories you fall into, Disney will affect us all in the same way. As before when I was talking about a brand becoming the product. Disney is close. How many times do you see a new animated film and ask the question…. Is this Disney? You have a direct association between the two. I love Disney and everything about Disney, its values, it’s messaging and it’s content. But it’s okay to admit that because I know you do too! Just Let it Go! But obviously, Disney has time, experience, exposure and billions behind them to get this right, so it’s a grand example. On a smaller scale, check out a smoothie company called Innocent, they are so approachable and funny, from their packaging through to their Twitter feed. Their brand is so consistent in the tone of voice. I recommend you sign up for their email newsletters! Brightens up a Friday morning. And I bet you thought I was going to say Apple because I’m a designer eh?! Unless you have a cheesy jingle, I don’t like you and your brand and everyone else shouldn’t too, I hate jingles…. Finally, any tools you’d recommend to help readers develop their branding? For tools no, it all starts with an idea. And research! RESEARCH RESEARCH RESEARCH! Keep up with what and how others are doing things. Trends seem to change like every day! So staying current is essential. One of the best industry blogs has to be InVison, the content is so relevant. And updated so often. I personally check this out every day! And their end of year reviews are just beautiful in them self and full of amazing content. One of the best industry blogs has to be InVison; the content is so relevant and updated so often. I personally check this out every day! Their end of year reviews are also just beautiful in themselves and full of amazing content. Also, a great place to start your research is www.awwwards.com, not only does this provide countless websites and brands to get yourself inspired, their purpose is that industry leaders provide feedback on the submissions so you can see if it offers more than just looking good. Again this, is typically where I start when looking at a new web project. And beyond that – places like Behance, logoed, Inspiration Grid and – yes Pinterest! Actually, Instagram is becoming a great source of seeing how brands communicate. And using a simple hashtag, the search is so easy! So, from food packaging for your corner cafe to cardboard box logos for your shipping goods, when it comes to branding, it’s crucial you get it right. Phillip Penaluna is a designer with 10 years experience in the fields of branding, print and digital. He understands the commercial aspect of design and the need for balance between aesthetics and usability. He loves nothing more than developing an idea and seeing it right through to completion and has a passion for seeing brands succeed.